1976 McCoy Reno Abelliro (sic, Abellira) Model 7 ft 2"
Bottom: slight vee through whole board, lighter at wide point. 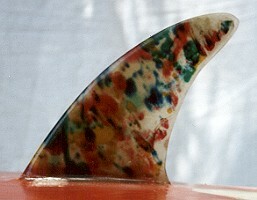 Clear laminated with multi colour resin splashes. Black McCoy script at sweet spot. Black Designed by Reno Abelliro text in box, below. Bottom: Black McCoy script at sweet spot. Purchased Huskisson Tip, NSW, 1999. Extensive tail repairs, largely due to leg rope damage. Made under license in Australia, McCoy also produced models from fellow Hawaiians, Barry Kanaiaupuni and Sam Hawke. 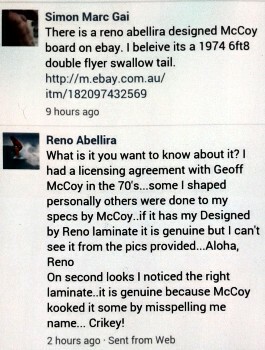 In the email reproduced right, Reno Abellira suggests that boards with the Reno laminate where shaped by him at McCoy's while in Australia. 2. "Quivers" - Mark Warren/Bruce Raymond in Surfing World magazine 1977? Vol 25 #1 pages 50 - 57. Geoff Cater (1999-2016) : Catalogue : McCoy Swallow-tail, Reno Abellira, 7ft 2''.